The Battle for Cassino featured large in the history of the 22 Battalion. A national commemoration was organised for the 50th anniversary in 1994. The 22nd Battalion was represented at this service. A further service was organised for the 60th anniversary, and again the 22nd Battalion was represented. 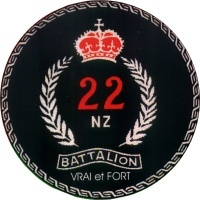 The 22 Battalion held its first national reunion in 1947, followed by other national and regional reunions at regular intervals. The 50th, and last, national reunion was held at Trentham in May 1990. Following the last reunion, local branches continued with annual meetings or Christmas dinners. In the last 5 years or so only the Katikati Christmas Dinner remained on the calendar. The 2010 dinner will probably be the last. This page is the start of a collection of material from those annual reunions and the more recent dinners. If you have copies of any material - photos, programmes etc - please contact me. For several years, the Bay of Plenty Branch of the 22 Battalion Association held a Christmas Dinner at the RSA in Katikati. Here is a selection of photographs of the participants. The final Dinner, in 2010 was recorded by TVNZ and featured on the TV1 Evening News on Sunday 5 December. There is a link to the newsclip. The 22nd was stationed in Hollingbourne, Kent, in the Winter of 1940/41, where they endeared themselves to the locals. A 70th commemoration was held in Hollingbourne in 2010, for which a booklet of memories was produced. Elements of the 22nd, led by the Commanding Officer Lt-COL Haddon Donald, were the first Allied troops to enter the Italian city of Trieste on 2 May 1945. Details of the event are recorded here. In May 2005 a 60th Reunion trip was undertaken by 24 members of the Battalion, along with other men and their families.A detailed account of the trip is recorded here.